OPTIMIZING your website and its performance isn’t a project…it’s a process delivered with expert SEO services. Can you see results in 90 days? Yes. Is that the best we can do? No…real gains happen with iterative change, based on ranking improvements to date…and fresh content, developed as landing pages for even more prospects. Additional work, as requested: Maintenance and additional content development/optimization as required. Successful search marketing begins with research. This develops into a strategy for organizing and crafting communications throughout your company’s online marketing plan. Great marketing is built on great content — informative, engaging, and speaks to your customers using their language. When sharp strategic planning meets great content, the search engines take notice. When they take notice, so do the potential customers you’ve been missing. Your company is the authority on what you do. It’s time your rankings reflected that. The expert B2B Austin SEO consultants at RefreshWeb will restructure your content and craft new content that draws in prospects who didn’t even know your company existed before they started searching. RefreshWeb is a specialized B2B search marketing agency. We understand your needs for accurate reporting, solid data, and measurable results. Recommendations are based on extensive research and market data, not trends. Our process is transparent and collaborative. 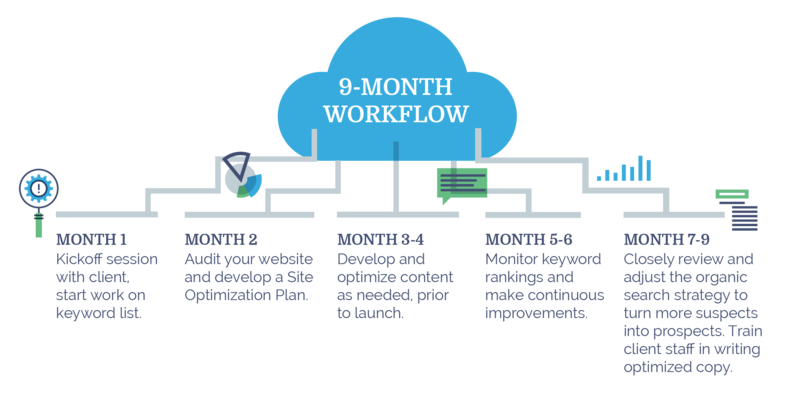 Clients not only see iterative improvement month over month, but they also see gains year after year as we work together to secure an ever-larger share of their target markets. That’s why you invest in expert SEO services, and work with a B2B web company that delivers on their promises. When you make the commitment to us for SEO, we commit the time it will take to really maximize your results. We’re expert Austin SEO consultants you can trust with your site, and your business.